In June, Olympic canoe racer Joe Jacobi's car was broken into and someone stole the gold medal that he won at the 1992 Olympics in Spain, WSB-TV reports. But fortunately for him, a 7-year-old girl in Atlanta by the name of Chloe Smith found the medal in a pile of trash while out walking with her dad. 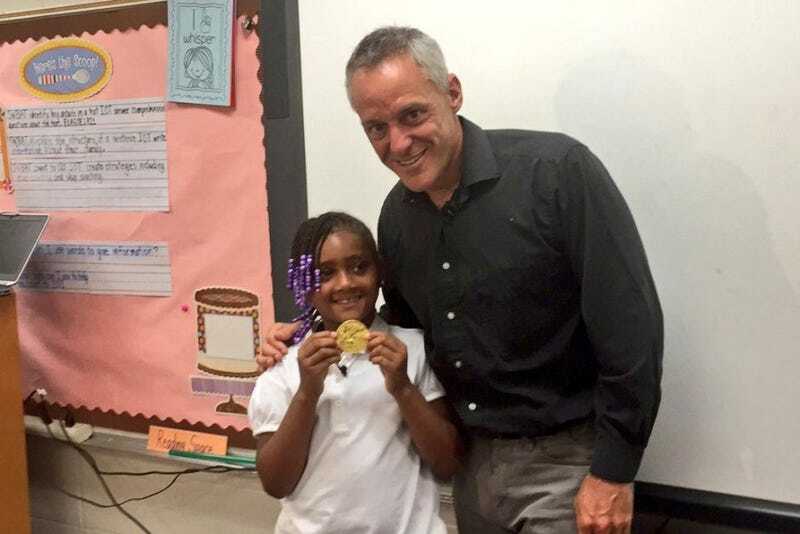 According to WSB-TV, Jacobi promised to visit Chloe's first-grade classroom so that everyone would know that she returned his medal to him, and on Monday he did just that. “It’s the idea of choosing to do the right thing, and so, Chloe, I thank you for good character and doing the right thing. And to her parents and her family, I thank you guys,” said Jacobi.